Hills Ferry Hunting Retriever Club will be holding their Second Annual Linda Soehren-Markos Memorial Super Singles Marathon on Saturday, July 30th, 2011. More information can be found on the Hills Ferry website at http://www.hillsferryhrc.com/Super_Singles_2011.html. Meeting minutes for our June 15th meeting are now available for member review in the documents section of our website. The board meeting on June 15th will be held at Del's Pizzeria & Italian Restaurant in Shell Beach. 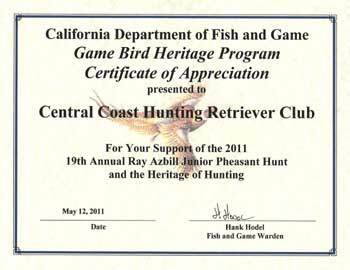 On February 12, 2011, Central Coast Hunting Retriever Club participated in the California Department of Fish & Game's 19th Annual Ray Azbill Junior Pheasant Hunting and the Heritage Hunting. If you are interested in learning more about this event, contact our club at admin@cchrc.com. Meeting minutes for our May 18th meeting are now available for member review in the documents section of our website. Those that choose to registration at the event will be charged an additional $5.00 per dog entered so please be sure to register online at www.cchrc.com. Thanks again this year to Patricia and Greg Varian and their family for their hospitality in allowing the club to use their ranch for our 2011 Super Singles. Central Coast Hunting Retriever Club is officially a CRTA member club! As a welcome gift CRTA is waiving the standard $35.00 non-member entry fee for the Pro Training Day with Brian Clasby on May 14th. This makes the total cost per handler for two dogs $15.00, normally $50.00!!! This is a great opportunity for members of CCHRC to see the CRTA training grounds and decide if becoming an individual member of CRTA is right for you. The lists of dogs qualified for this years NAHRA Western Regional are available below. The Regional is being hosted by Puget Sound Retriever Club on June 25 in conjunction with their normal NAHRA Field Test (6/25-26/2011) held on club leased grounds near Tahuya, Wa. Next to Tahuya State Forest, & the Hood Canal with views of the Olympic Mountains. Premium will be available soon. Laura & Steve Fletcher from Patterson, Ca. Laura Kinney & Mike Hughes from Wa. Wally Kobeski & Marty Grabijas from Wa. Congratulations to all the qualifying dogs and to our very own Cash, Ella, Feather, Moxie, RC, Spirit and their owners! Meeting minutes for our March 16th meeting are now available for member review in the documents section of our website. Congratulations to everyone and see you all next year!